Here it is...Our 2016 Schedule to keep you busy all year long. 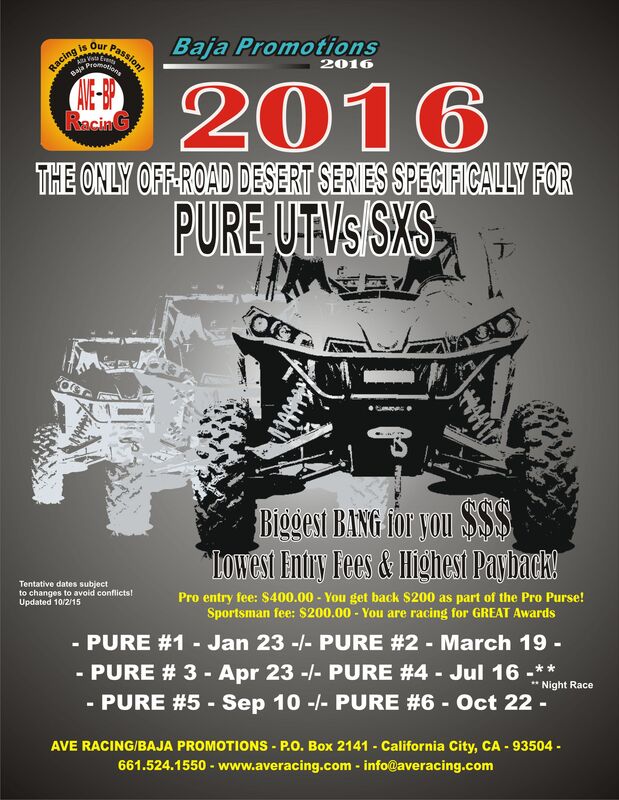 We are back with our PURE UTV Series, the preeminent off-road desert series in the Country; and we are back with our SUPER-COURSE MC/ATV Series, after two years of development. It is stronger, faster and better than ever! We've always said that "racing is our passion." So here we go. Racing Drones! We are putting together a schedule for 2016 for possibly three or five events out of Alta Vista Rancho. Check it out! This is a preliminary layout of an aerial course that would include helium balloons at various altitudes, left and right colors (Yellow/Red), plus "arches" at ground level and on high spots, all to determine the skills of the "FPV" (First Person View) flyers.